Before an OS Update, Business IT needs to make sure a secure and recent backup of all user data is available. 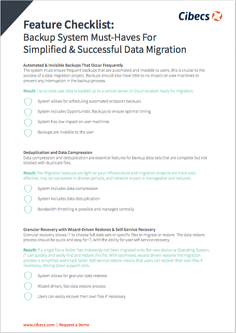 When choosing a Backup System to simplify your OS Upgrade and make data migration easier, these are the important features you should be looking for. The must-have backup policy-setting features. Why data compression and deduplication are vital. The importance of persona-based backups before an OS Upgrade. What data restore features to look for. Download the checklist by filling in the short form on the right. Gregory Alexander, the Perinatal HIV Research Unit’s IT Manager.